The preferred chauffeur service at Edinburgh Airport and the only company to be able to offer airside collections straight from the steps of the plane, Edinburgh Executive Carriages is an Edinburgh chauffeur company that will provide you with that personal touch. Whether your booking is for business or pleasure, we will ensure your experience is second to none. 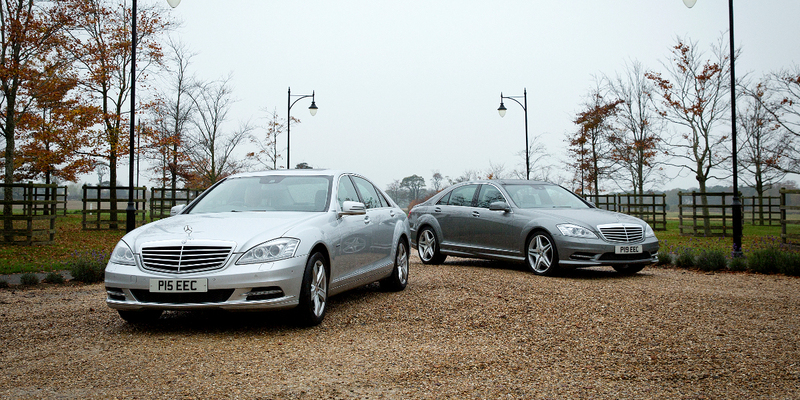 All of our chauffeur driven vehicles are immaculately presented and, specialising in Mercedes Cars, you can be assured your journey will be a calming and relaxing one. A first choice for chauffeur services in Scotland; experience a truly exceptional customer experience. EXCLUSIVE AIRSIDE SERVICE – Collections from all domestic flights from the steps of plane. A first for Scotland, we are the only company that can provide this exclusive service. Contact us for more information. VALET PARKING NOW AVAILABLE – Exclusive to Edinburgh Executive Carriages, right next to the terminal straight to the car, contact us for more information. Operating a chauffeured airport meet and greet service, you will arrive at your destination in comfort and style. We will track your flight on arrival and you will be met by one of our experienced chauffeurs. Providing a luxurious way to travel throughout Scotland and England in a chauffeur driven car with our many years experience you can be assured of a relaxing journey. Ensure the perfect golfing trip by arriving in luxury and style with your own personal chauffeur. Mercedes V-Class’s available with 7 passenger seats. Combine with our meet and greet airport service. We provide private sighsteeing tours where you can visit the beautiful sights of Scotland and England. Destinations include the Highlands, Islands and Scottish Borders. Whatever the special occasion, a birthday, anniversary or just treating that someone special in your life to a luxurious day. Make it special by booking them their own personal chauffeur. For one of the most important days in your life. Arrive in style on that special day in one of our luxurious wedding cars, driven by one of our professional chauffeurs. Clients are welcome to open accounts with us for any of our chauffeur driven services. Please contact us for more information. You can book Airport Transfers and Executive Business Travel online through our online booking system. Alternatively, please contact us with your requirements by e-mail. For more than five years Paul has been consistently reliable when taking me to my early morning business flights and picking me up on my late return. When I have asked Paul to transport colleagues I have done so certain that he will be smartly suited, courteous and on time. His Mercedes is always immaculate. As an extended family we ask Paul to take us to a wide range of personal appointments knowing that again we can rely on him. I have used Edinburgh Executive Carriages for both personal and corporate travel. They consistently provide an excellent, efficient service which is always reliable and thoroughly professional. I would certainly be happy to recommend your services! We used EEC for our 50 delegate EMEA conference which included several very senior attendees. EEC’s highly professional and reliable service meant I could relax in the knowledge everyone would be looked after perfectly, on time, with no complications. Certainly recommended. We accept all major credit/debit cards, bank transfer and online payment. Regular clients are welcome to open accounts with us.